24 x 22", 600hp engine; Warrington, Chicago, IL; 14 x 6' boilers, Brenman, Detroit, MI. 1862, Jun 6 First enrolled Chicago, IL. 1869, Apr 24 Owned A. Crawford, Detroit, MI; 125.5 x 20 x 11'; 177.97 net tons. 1870, Jun 23 Blew out one cylinder head in Pte. Aux Pelee, Lake Erie. 1873, Nov 8 Towed disabled steamer R.J. HACKETT from Escanaba, MI to Manitowoc, WI for repairs. 1874, Apr 2 Rebuilt; 279 gross tons; owned H.P. Crawford, Bay City, MI. 1874, Sep 29 Raised scow MARIA from Inverhuron, ONT, Lake Huron; towed her to Port Huron, MI for repairs. 1875 Owned G.C. Brockway, Port Huron. 1877, Oct 12 Aground in gale, Presque Isle, MI, Lake Huron. 1878, Dec 13 Documents surrendered Port Huron; total loss Apr 21, 1874(?). 1881, Aug 5 Wreck released; repaired Port Huron. 1881, Dec 8 Re-engined James Fitzgerald; reboilered Scoville & Love, Detroit, MI. 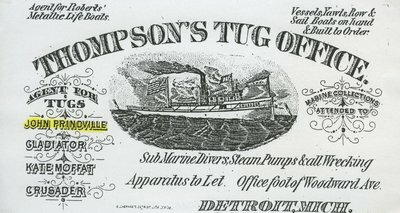 1882, Apr 29 Renamed CHARLES KELLOGG; owned Detroit Tug & Transit Co; 270.01 gross/178.67 net tons. 1882, Sep Machinery broke; towed to Chicago for repairs. 1884 Owned Michigan Navigation Co., Detroit. 1884, Sep 30 Owned John Charlton, Lyndoch, ONT; C88622; renamed CHARLTON. 1892 Rebuilt; re-engined; fore & aft; 22 & 44 x 32"; 400hp; 85rpm; Doty Engine Works, Toronto, ONT; 1 firebox boiler; 10 1/2 x 16'; 105# J. Inglis, Toronto, ONT. 1893 Lengthened 15' Owen Sound, ONT. 1894 135 x 19.4 x 10.4'; 389 gross/264 net tons; used for rafting & wrecking Lake Huron & Georgian Bay. 1896 Lengthened; rebuilt Collingwood, ONT. 1899 145 x 19 x 10.6'; 389 gross/264 net tons. 1900 Reportedly in Chicago Towing Co. fleet. 1906 Owned Boutelle Towing Association, Windsor, ONT; 398 gross tons. 1930 Owned Victoria Harbour Lumber Co., Victoria Harbor, ONT. Date Unknown Owned Du Fresne Construction Co. Ltd., Montreal, QUE.